Don’t ever be lulled into a false sense of security that you are immune to identify fraud. At the Toronto Police Service Financial Crimes Unit (FCU) annual financial literacy month launch at Humber College on November 5, 23 Division Superintendent Ron Taverner reminded citizens that identity theft is the fastest growing crime in North America and that anyone could be a victim. “With your identity, criminals can apply for loans, mortgages, credit cards, leased vehicles and apartments,” he said. Taverner said shoulder surfing is the technique most criminals use to get information in crowded places because it's relatively easy to stand next to someone and watch as they fill out a form, enter a PIN number at an ATM machine, or use a calling card at a public pay phone. “It’s easy for them to get that information because they know what they are doing,” he added. Taverner offered some helpful tips to prevent citizens from becoming victims. ”Never use a public computer for financial transactions, install virus protection, report a theft or loss of your personal information and do a yearly credit check for yourself to ensure that the information that’s there is accurate and correct,” he pointed out. Three years ago, the FCU collaborated with the Financial Services Commission of Ontario (FSCO) to create the Social Media Working Group. “This group was created to assess the viability of improving public education of financial crimes and victimization,” said Detective Gail Regan. The group comprises private sector companies and public sector agencies that share a common interest in both customer and/or public awareness of financial crimes through social and digital media platforms. “They are committed to expanding the individual and collective footprint in both social and digital media platforms to enhance awareness of financial crimes and their prevention,” Regan said. 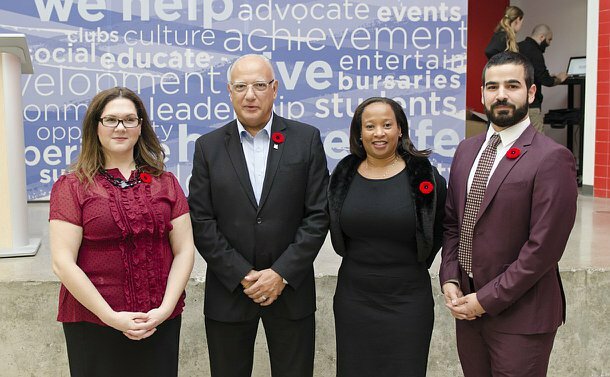 Jenna LeBlanc of the FSCO, Humber student Amar Abdul-Raheem and councillor and Deputy Mayor Vincent Crisanti also spoke at the event. “Financial literacy is essential to the planning of financial security,” Crisanti said.